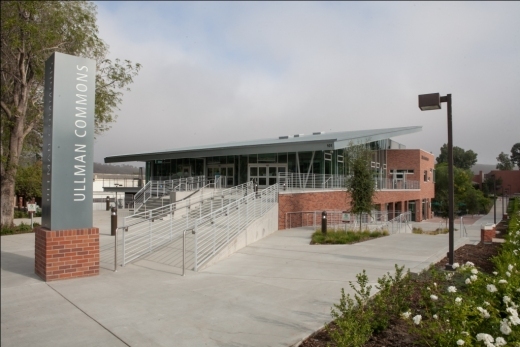 California Lutheran University (CLU) announces the grand opening of the $15 million Ullman Commons at 101 Memorial Parkway in Thousand Oaks. The 20,000 sq ft building includes an all-you-can-eat dining hall, a quick-service counter called Ullman To Go, a Starbucks and a conference center. Designed to transform the heart of campus, the facility provides a gathering place for students, faculty, staff and visitors. It features glass curtain walls and second-floor balconies overlooking Kingsmen Park and the academic corridor. The dining hall, which is open to members of the CLU community and their guests, serves a wider variety of food than the former facility. An international station offers Mongolian grill and Asian wok options as well as vegan food, sushi, samosas, and fried rice and noodle dishes. Diners can order from the grill, pick up daily specials or wood-fired pizza, and serve themselves at the pasta, soup, salad and dessert bars. A deli station offers made-to-order sandwiches and wraps. I had the pleasure of visiting the dining hall and was extremely impressed! Ullman To Go, which is open to the public, sells fresh-baked pastries, made-to-order sandwiches and prepared wraps, sandwiches, salads, soups, pizza and hot entrees. Starbucks is open daily from 7 a.m. until midnight, providing a gathering spot for students as well as community members attending events. 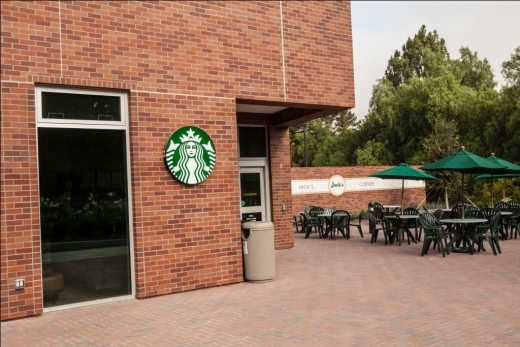 The CLU Starbucks, the 18th Starbucks in the Conejo Valley, has three times the seating of the chain’s typical cafes, with 65 spots inside and a patio with space for about 50 people. The patio, which features a fire pit, is called Jack’s Corner in honor of generous donor and longtime Cal Lutheran Regent Jack Gilbert, who died in 2012. Their phone is 805.492.2411. The first-floor conference center has two rooms for banquets or lectures that can be combined, a smaller seminar room and an intimate dining room. The building was designed to earn LEED (Leadership in Energy and Environmental Design) silver certification. It uses natural lighting and ventilation extensively and has water-saving fixtures and a system designed to turn waste into compost. Ullman Commons is named for a family of alumni and generous donors who provided a $2 million gift for the facility through their foundation. Learn more about CLU at www.callutheran.edu.